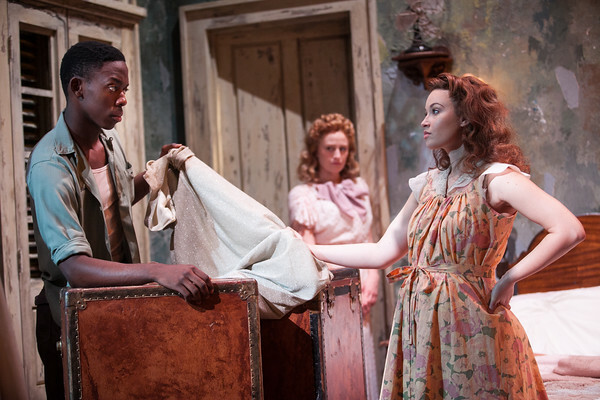 Tennessee Williams’ A Streetcar Named Desire, is my all-time favorite play. Mainly because it is filled with so many human emotions, elements, and experiences in one compact 2 hour (normally) production. The problem with seeing your all-time favorite show is that you often come in with certain expectations and thoughts. Currently the University of Texas At Austin is staging a topnotch production of this classic play. The show from a technical standpoint is by far the best I have ever seen, and I have seen this show more times than I can count. The acting for the most part is solid and very well crafted. The moment you walk in to the Brockett Theatre you are taken aback by the enormity and detail of the set crafted by Teena Sauvola, the two story balcony, spiral staircase, portieres, and large plantation shutter windows are breathtaking. Then you start to notice off of her details that she has woven into the pieces, the broken plaster on the wall above the bed, the little items in the kitchen, the aging of all the furniture. The scenic design alone is worth the price of the tickets, then you add the phenomenal lighting design by Andrew Carson, which helps to not only set the mood in multiple moments, but adds the feeling of being in the muggy and steamy New Orleans in the late 1940’s. Pair those two elements with the sound design by Jared LeClaire and you have a show that no matter what the actors do it is already riveting. The Actors also do not disappoint, well the ladies don’t. 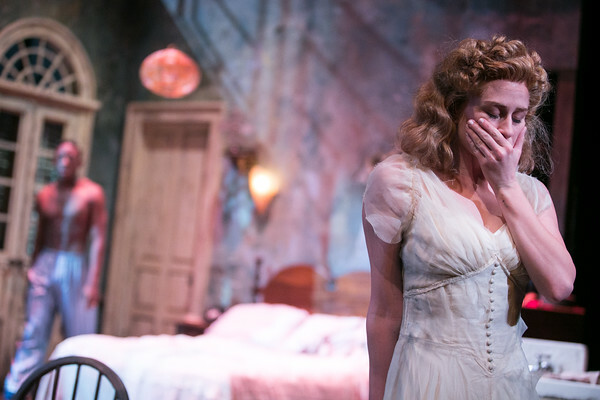 Juliet Robb as Blanche DuBois is stunning, making the most of every opportunity, showing her well nuanced and layered character as a true triumph of the UT Department of Theatre and Dance. Robb literally steals the show in every moment she is on stage, however her accent work is very mangled and all over the place. It is hard to believe she was born and bred a deep south Mississippi belle. Aside from that one distraction she should receive at least a nomination if not the final prize for one of the area theatre awards. Robb is not the only actress with some serious chops in this production, Alyse Ullery as Stella Kawalski is a force to be reckoned with! Her take on Stella is a real breath of fresh air, for too long we have seen Stella as the love sick battered wife of the brutish Stanley, typically a weak and melancholy character. However Ms. Ullery gives Stella a strength and boldness that fits well and shows that she is a truly gifted actress. The moments when she goes head to head with her husband Stanley, played by Keith Machekanyanga, and with her sister Blanche is truly great theatre. There are a few major and minor problems with this production. The most important problem for me as a patron and as a critic is the extremely long running time, the show is 3 hours long not counting intermissions which there are 2 of. This was caused by some slow pacing, several long pregnant pauses in which there is no one on stage or poorly executed scene changes. To me this is a show of passion and emotion, it should be rapid fire, quick and heated. Instead Director Jess Hutchinson has crafted a slow drawn out uncomfortable show with very little energy. Another issue for me is the blocking of the show, where the actors are placed and stand throughout the performance. The Brockett Theatre is a thrust stage meaning there are audiences on 3 sides of the stage, and Hutchinson seemed to either not be aware or not care that for large portions of the show over half the action to all of the action was performed where a large portion of the audience on the two sides of the stage could not see what was happening. Then there is the issue of Stanley, played by Keith Machekanyanga, who comes across as a very flat, uninterested, unintimidating slack of a man. His performance comes across as more a grumpy child throwing a 3 hour temper tantrum, that a man that exudes testosterone and passion. There is also the small and really unimportant problem with the script and the casting not working. I am all for color-blind casting and I applaud the University of Texas for creating this very thought provoking production with an interracial marriage in the deep south in the 1940’s. However there was ABSOLUTLY NO REFERENCE to that point in the production except for one well delivered line by Blanche. In fact they neglected the most interesting part of the show so much that they did not even change the dialogue to reflect the issue, Blanche just continues over and over again to refer to Stanley as a Pollock, and granted I am not one for changing the writers words, but when you change the casting to something so obvious as this production you would think they would at least come up with a different pejorative than Pollock and insult for the most pasty white people on the planet. All of that aside, I did really like this production, the scenic and technical element paired with superb acting from Robb and Ullery helped to keep the problems moments in the back of my mind. I give this production 3.5 out of 5 stars, mainly for the long running and the second pointless intermission, paired with the lack of attention to the most innovative and interesting element of the show.